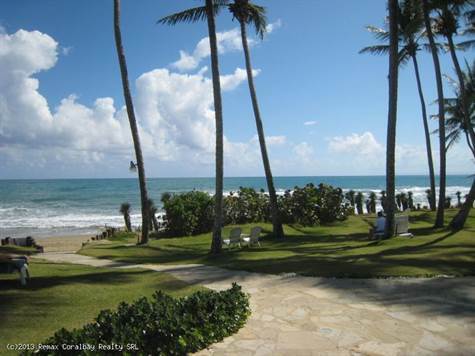 This is a large and lovely modern beachfront condo in one of the most popular complexes in Cabarete. Excellent quality, spacious, furnished, this one is ready to move in and has all the amenities including extra large covered terrace that opens to both the living area and master bedroom, large kitchen with gorgeous granite, stainless steel stovetop/oven and dishwasher, wooden wine rack, etc. All three bedrooms have ensuite baths, plus an additional half bath for guests. The open floor plan is light and airy, and the Spanish Colonial arched doorways accented with coral stone are another mark of good taste and high end appointment. Laundry room has separate washer dryer and plenty of room. Fully air conditioned in every room, onsite restaurant, very affordable HOA and onsite management, this really is a place you could call your tropical home. HOA includes once a week maid service, insurance, apartment and bill management, cable, Internet, gas and water, and common area fees!! Apartment comes with additional storage locker perfect for stashing beach and surf gear.